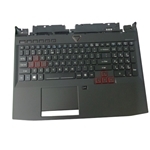 Description: New Acer laptop black upper case palmrest, keyboard and touchpad. This may be the part you need to replace your cracked or broken upper case. Compatible Part #'s: 6B.Q0SN5.001, 13N0-EXA0311. Acer Predator 15 G9-592, G9-592G, G9-593, G9-593G.